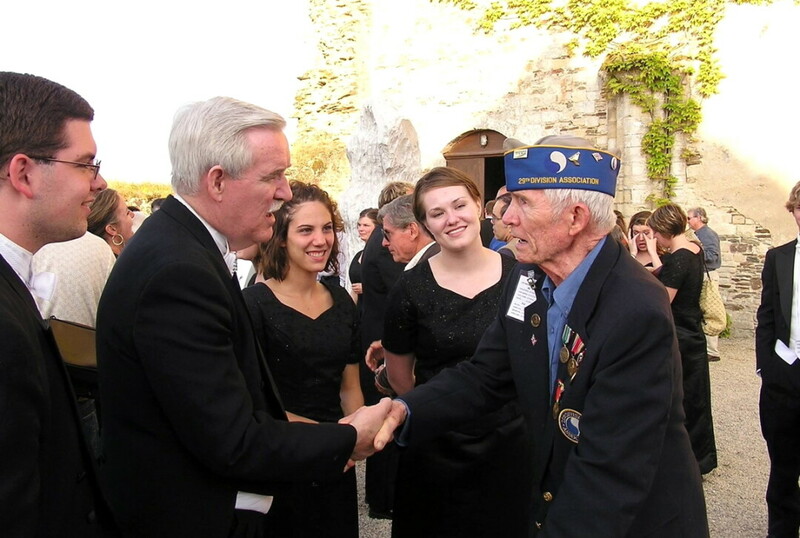 Dr. Gary Schwartzhoff, second from left, meets a veteran on the 60th anniversary of D-Day in France. He will lead the UW-Eau Claire Alumni Choir when it performs this summer at the 75th anniversary of D-Day. France is probably most famous for its art and cuisine, but it’s a well-kept secret that the French also really love choral music. Most cities and towns, including Paris, boast cathedrals and churches that are home to spectacular organs and magnificent choirs. This summer, that love for music will be played out at the Paris Choral Festival Commemorating the 75th Anniversary of D-Day. The UW-Eau Claire Alumni Choir, under the direction of Dr. Gary Schwartzhoff, will be there, representing Eau Claire and singing their hearts out in commemoration. For, as festival organizers put it, this is a celebration of the centuries-old Franco-American friendship. France’s rich history will be on full display throughout this trip. While in France, the choir will travel to Normandy and perform at the American Cemetery, where American troops who died in Europe during World War II are honored. There, the musicians will participate in an Independence Day “Choral Remembrance” and a wreath-laying ceremony. The choir will then return to Paris. After a couple of days of serious rehearsals, with a little free time tucked in between, the UWEC contingent will join with 13 other ensembles from across the United States to form a 350-member choir with orchestra to perform in the world-renowned Church of the Madeleine. There, they will be singing a collection of choral works, including music by French Composer Gabriel Fauré, and the chilling masterpiece, “Eternal Father, Strong to Save,” adapted from the Benjamin Britten opera, Noye’s Fludde, a song which became the United States Navy Hymn. Schwartzhoff will serve as the artistic director and conductor. One member of the 2019 ensemble making the trip, Marcia Van Beek, has participated in both of the previous UWEC Alumni Choir European trips under Schartzhoff’s direction. Van Beek is a charter member of the alumni group, and of The Master Singers, an Eau Claire choral group also directed by Schwartzhoff. Van Beek says that she was drawn to this concert tour as a chance to commemorate the 75th anniversary of D-Day. “I see this as an opportunity for the participating musicians to not only share our gift of music but to be ambassadors for our country,” she said. She is especially looking forward to their performance at the American Cemetery in Omaha Beach, France. Knowing firsthand that music is a powerful way to bring people together, Van Beek hopes their performances will cross boundaries as they commemorate the lives of those who fought to liberate Europe during World War II. The 75th Anniversary of D-Day is a solemn event worthy of glorious commemoration. The UW-Eau Claire Alumni Choir, under Schwartzhoff’s skilled direction, aims to pay the soldiers the homage they are due, using the power of choral music. The Eau Claire Master Singers, under the direction of Gary Schwartzhoff, will perform Sunday, March 17 at the First Congregational United Church of Christ. Members of the Eau Claire Chamber Orchestra and guest organist Christopher Stroh will join the group to present Requiem for the Living, Dan Forrest’s 40-minute, 5-movement prayer for rest. Tickets are available now at Festival Foods, First Congregational UCC, and at the door. Adult tickets are $18 and student tickets are $5. The singers will also perform Requiem for the Living at ECCO’s Norwegian Conference concert at the Pablo Center for the Arts on March 23. The orchestra, conducted by Frank A. Watkins, will also perform Edward Grieg’s Holberg Suite and Johan Halvorson’s Suite Ancienne, Op. 31 in a show that honors Eau Claire newspaperman Waldemar Ager and Norwegian heritage. More information about the Master Singers and their 26th season is available online at www.themastersingers.net. Information about ECCO’s March 23 performance can be found at www.pablo.org.